The Evenup™ was developed by foot and ankle specialists that saw the need for a simple, effective way to help patients suffering from hip and back pain while recovering from an injury or surgery in an orthopedic boot or wound healing shoe. Prevent hip, knee and back pain! 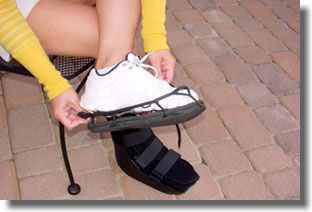 Are you walking in a fracture boot, also known as an orthopedic walking boot, or are you wearing a post-op shoe, a CROW boot or a wound-healing shoe? Even small differences in leg length can affect your walking and may cause pain or discomfort in your hip, back and knee. 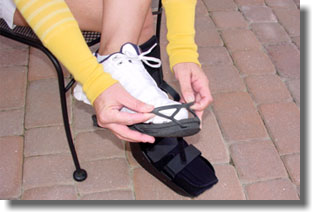 The Evenup was developed by foot and ankle specialists that saw the need for a simple, effective way to help patients suffering from hip and back pain while recovering from an injury or surgery in an orthopedic boot or wound healing shoe. A customer and patient favorite! Comes in 5 sizes (adults only). Each Evenup has two height adjustments. Easy to put on and take off. Please note that Evenup is designed for temporary use. 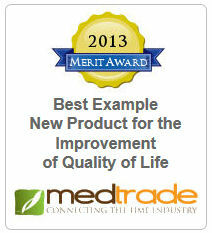 The life span of this product is approximately 2-3 months dependent on daily use. Step 1: Cross your leg over the opposite knee. Pull the Evenup over the toe of the shoe. 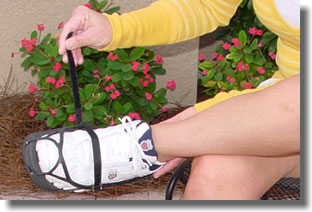 Step 2: Pull up the back of the Evenup straps over the heel and adjust the side straps around the sole. Step 3: Make sure the Evenup name faces out at the heel. Adjust the sole of the Evenup to center on the bottom of the sole. 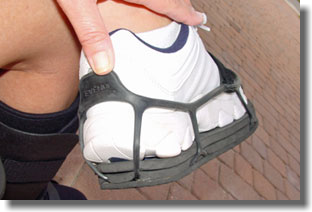 Step 4: Pull the Velcro strap across the top of the foot and fasten to secure the Evenup. Pegs in the top layer of the Evenup sole fit into the holes in the bottom layer. The single layer bottom is 1.3 cm thick. By adding the top sole the Evenup adds 2.1 cm in height. Use the measurement technique below to determine your appropriate size even if you have ordered in the past. To be used with flat-bottomed or low-heeled loafer shoes only. EvenUp is not designed to work with heels, sandals, or mules (no- or low-back shoes). Any questions? Please contact us directly at 1(800)CASTCOVER (1-800-227-8268) or email us at cs@castcoverz.com.